Jorge Morales-Picó in Bohemian Lights. Photo by Rachelle Klapheke. BOTTOM LINE: A bold attempt at mounting a new adaptation and a new exploration of multi-media theatre. Based on the play by Ramón Valle-Inclán, this production has a fascinating history. The original play takes place during the Spanish Restoration in the 1920s, and Valle-Inclán addressed society’s collective neglect of artists. (Sound familiar?) In this English language premiere, Live Source and dramaturg/translator Fernando Gonzalez are attempting to bring this play to American audiences in as many forms as possible. The film version premiered last September, and in this live production the film plays on screens behind the actors to make a multi-media visual and sound scape. Although I appreciate the creative risks in this adaptation, I wonder if the moving image distracted us from the story in ways it did not intend. The blind poet Max Estrella (played by Jorge Morales-Picó) is about to embark on the last night of his life. He is known in Madrid as “the people’s poet,” yet the academy refuses to recognize his artistic genius. His book is not selling well, the nation is in political and economic upheaval, and he and his wife barely have enough money to eat, yet Estrella drinks away his depression and his pennies. His last journey begins when friend and drinking buddy Don Latino (Jesse Friedman) recounts how he tried to acquire the money he owes Estrella by pawning a few copies of his book. But, the vendor would not pay Latino enough. The two friends find the vendor and try to demand better pay, but the vendor refuses. With what little money they have, Estrella and Latino go to a local bar, and so begins Estrella’s topsy-turvy journey through police brutality, riots, aspiring revolutionaries, crooked politics, and starvation. The world of Max Estrella is extreme disorientation. The severity and violence in Madrid astounds Estrella to the point that he declares a new genre of poetry dedicated to describing cruelty. Yet, the very cruelty he wishes to put into verse kills him. 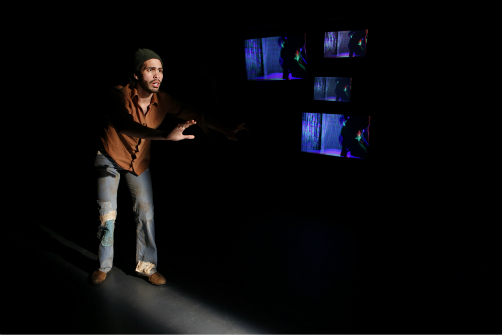 The video projections that play alongside the live performance similarly create a disorienting world for the audience. The television screens display the film, and each scene in the play is back-dropped by its corresponding film scene. Sometimes the film is silent, sometimes the film’s audio plays at the same time as the actor’s dialogue, and sometimes the film takes over the scene. Also, there seemed to be one or two hidden cameras on the stage that picked up the actor’s movements. The projections sometimes switched between the film feed and the live performance feed, or both feeds were played over each other. On top of these multiple levels of disorientation, the cast in the film is different from the cast on stage. So, the audience is essentially watching two separate worlds telling the same story. These projections are a clever way of providing the play’s set. In the same way that Estrella continuously travels from one place to the other, the set also continuously moves. And watching these two worlds flow and bleed into each other certainly achieved confusion. Yet, in watching this active interplay between stage and screen, I found myself paying more attention to the projections, or to the similarities/differences between the projectors and play, than I did the actual story. The relevance and importance of this story felt overshadowed by the multi-media experimentation. Perhaps this in and of itself was a commentary on society’s irreverence to artists? Or was it an unintentional side effect of disorienting your audience? Frankly, I could not tell.